After going through the entire season without a first team shirt sponsor, British car manufacturing giants Rover struck a deal in the week leading up to the 1994 Scottish Cup Final to sponsor the team for the next two seasons – starting with the Cup Final itself. The Cup Final strip was the same strip that the team had worn all season – with the diamond pattern, the black & white flashes on the shoulders and the newly redesigned Club badge. The only change was the addition of the Rover logo emblazoned on the front, in white text on a burgundy background. The one off kit went down in United folklore, as the team defeated Rangers 1-0 in the Final at Hampden on 21st May 1994 to win the Scottish Cup for the first time in the Club’s history. 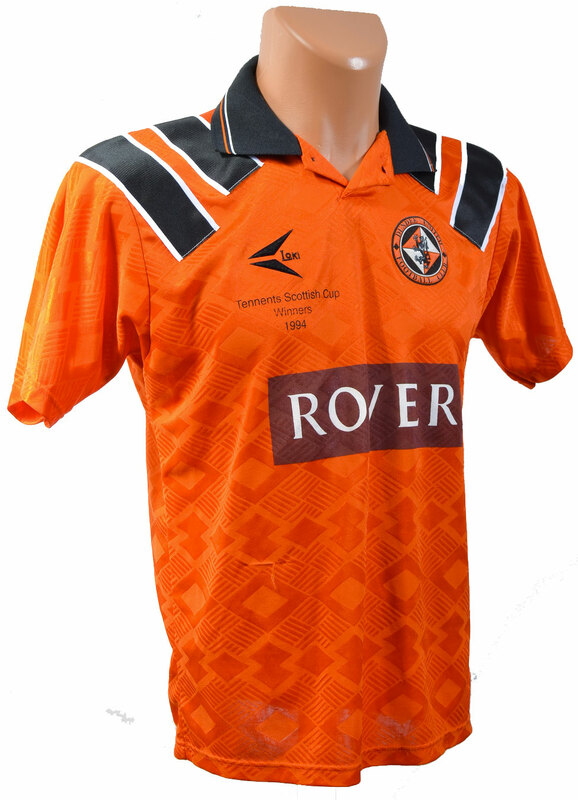 To celebrate the event, United released a commemorative replica top with the Rover logo included, and an additional note under the Loki logo which read “Tennants Scottish Cup Winners 1994”.